Looking for an attractive way to showcase valuable items? These tower display cases have a narrow design that can fit into compact floor space in boutiques, retail stores, lobbies, schools, museums and event venues. Shelving like this will look great in any corner or in the center of a room. These tower display cases, also called contemporary glass showcases, can hold fragile artifacts, expensive items, hard-won trophy collections, rare photographs or hand-made exhibits. Their medium-density fiberboard and tempered material construction will keep their contents safe. These tower display cases have a high quality construction and feature a modern design that complements exhibits instead of distracting from them. What features are common to all of these contemporary glass showcases? 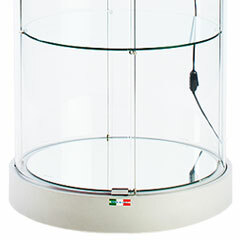 Each tower display case offers 360° of visibility with their clear sides and shelves. This allows trophies, jewelry and other contents to be easily seen from any angle. In addition, tempered glass is much more durable than regular materials and will withstand any high traffic environment. 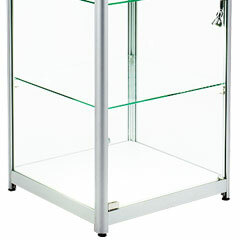 Tower display cabinets have a small width of 24" or less that allows them to fit onto almost any floor. However, each fixture has a large amount of storage space because they typically measure about 75” tall and have three or more areas for displaying valuables. These contemporary glass showcases are all made of laminated or painted medium-density fiberboard. This means that each model comes in a variety of finishes, usually including silver, black, white, cherry, maple and oak. What can these narrow display cases be used for and where can they be found? Retail stores often use them to conserve valuable floor space because of their compact design. Gift shops often merchandise glassware, jewelry, sports memorabilia, pottery and other wares with these full view tower display cabinets. Schools will often use them to show off inventive projects, team trophies, jerseys, seasonal decorations and awards. Colleges and universities will often place these display cases in high traffic lobbies of important buildings for maximum visibility. 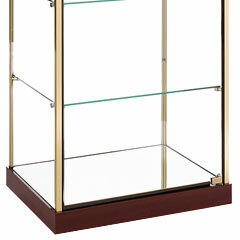 These high quality display cases are ideal for museums because they make exhibits the center of attention. They can be used for featuring ancient artifacts, works of art and other interesting items. Fixtures like these are also excellent for residential environments because their narrow design can fit into any room. Family members and guest will be impressed by the professional shelving for holding curios. This type of case comes with different features that make them more suited for different environments. What options are specific to certain models of the full view stands? Cases with height adjustable shelves are great for storing curios that may be too large to fit in other spaces. Alternatively, if there is only one item for display, empty shelving can be removed. Each adjustable shelf is made of full view tempered glass for maximizing visibility from any angle. Narrow fixtures with a locking door will keep their contents safe from tampering and theft. These models are ideal for public places like schools, museums, offices and retail stores for protecting valuables. In shops, employees can unlock the door for interested customers who may want to make a purchase. Each has a strong tempered fabrication, allowing onlookers to see inside while remaining sturdy. Adjustable shelving like this often comes with lighting for putting curios and artifacts in the spotlight. Illuminated racks can have top and/or side lights for illuminating merchandise and trophies from any angle. In addition, some units feature lighting that can be moved to create custom illumination setups and shadow effects. Stands with an addition storage area are excellent that need to keep extra materials out of sight. This enclosed section can be found in the base and has a locking door for extra security. Storage bases are made of solid medium-density fiberboard and can temporarily or permanently hide curios and merchandise. These full view shelves for homes and retail stores are available in three main styles: square, rectangular and round. Each has its own unique design and different possibilities. Square units can range anywhere from 15” to 24” wide. Rectangular shelving either measures 20.5” or 24” wide. All circular racks are 76” tall, measure 22” in diameter and include built-in wheels for easy transport. Find the right one for your needs today on DisplayCabinets2go.com!